Members of the Watertown High School girls basketball team ran a clinic for youth players on Sunday morning. 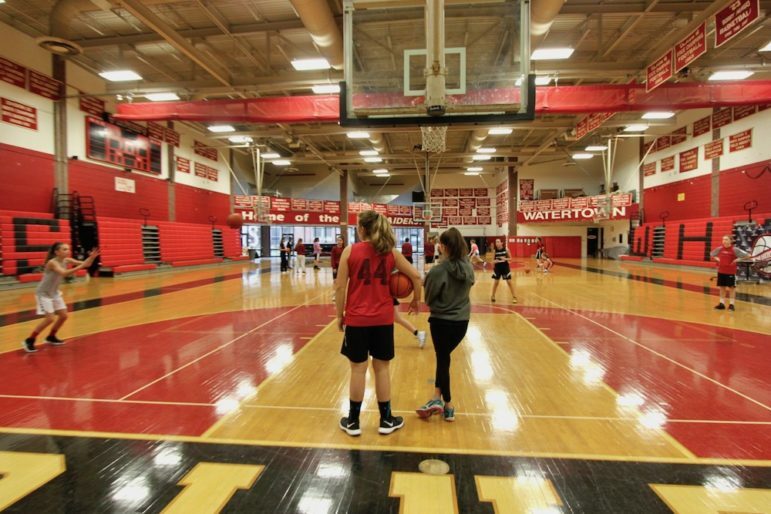 Members of the Watertown High School girls basketball team spent their Sunday morning at a special team building event, one in which they look to improve this year’s squad and hopefully pay off in future years. WHS Head Coach Pat Ferdinand dubbed the event Media Day, but for the team, the focus of the clinic was working with youth basketball players who came to the event at the WHS Gym. The morning was filled with much more than shooting, dribbling and passing. 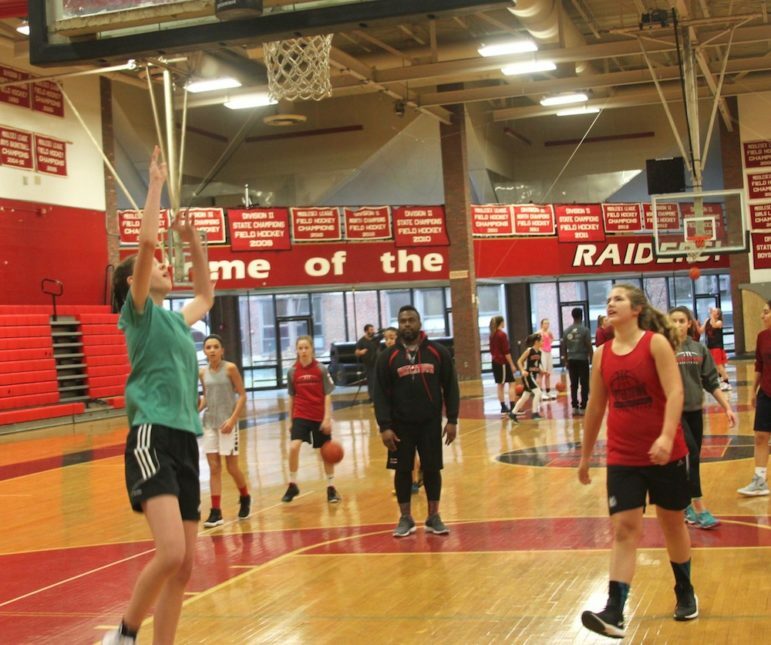 The youth players, most of whom are currently at Watertown Middle School, worked with high school players on the drills and plays run by the Raiders, said junior Annabella Beck. Pat Ferdinand, Watertown High School’s girls basketball head coach, said the clinic will help the players, young and old, alike. He hopes the Raiders will have a new attitude in 2018-10 after a rough year last season. For many years, Ferdinand’s players have coached youngsters in Watertown’s in-house league, but was the first time the youth players visited the high school. The Raiders just started practicing earlier in the week, and for some of the players it was fun to be on the other side of things. Freshman Taylor Lambo and her classmate Sophia Garapetian got to work with their younger sisters at Media Day. Assistant Coach Josh Smith said that events like the Media Day will pay off down the line when the youth players get to the high school. It was also a big deal for the younger players. Players from Watertown’s girls youth basketball program got a taste of what it is like to be on the Watertown High team at Sunday’s clinic. Ferdinand sees the 2018-19 season as not only a year to rebuild the team, but to change the team’s attitude. Last year, the Raiders won only one game. The Raiders’ captain will be junior Brianna Williams, who said that she too has seen a shift in the team’s attitude. “This year there is a different feel,” said Williams said, who added that the team is more competitive and shows more toughness. The players who will get onto the court in games will be the ones who earn it, Ferdinand said. The team has three seniors, and not all of them played on the youth travel team. Some earned it by working had at WHS, Ferdinand said. Youth and high school players came together on Sunday for a clinic run by Watertown High School girls basketball coach Pat Ferdinand and his assistant coach Josh Smith. Neila Magloire said she only started playing basketball as a freshman and now as a senior she hopes to be a leader. “As a senior you have some leadership role, but freshman through seniors we are all leaders on and off the court,” Magloire said. Magloire said she is always looking for ways to improve. “There are always new things you can do to help your game,” Magloire said. To give the team more of a boost, Ferdinand gave the team’s facilities an upgrade. 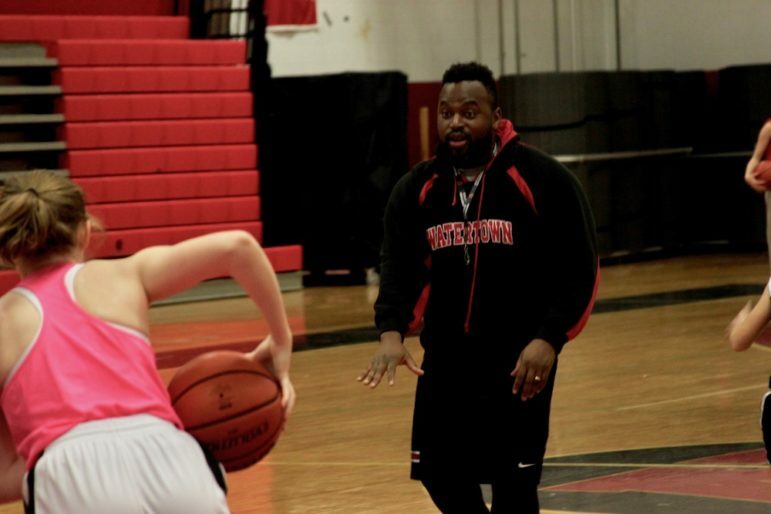 The first game for the Watertown High School girls basketball team is on Dec. 11 at Winchester. The first home game will be Dec. 18 at 7 p.m. against Arlington.